Few will read this book without it finding their perspectives in some way altered. 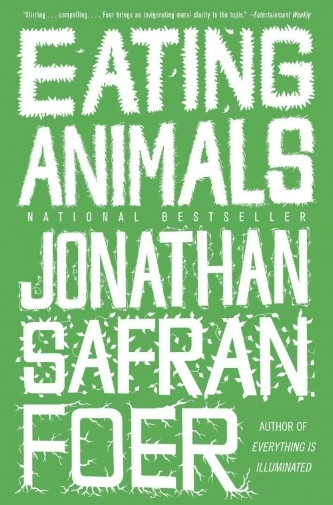 “Farming by proxy,” a concept and phrase attributed to novelist and activist Wendell Berry, provides a philosophical anchor for Jonathan Safran Foer’s excellent book Eating Animals. Said another way, our choices matter. This sentiment girds the author’s quest to understand the implications – ethical, economic, environmental, cultural and personal – of one’s individual choice to eat, or not eat, meat. As readers, we follow along on his quest for knowledge and insight, and uncover information as he does. An on-again-off-again vegetarian throughout much of his adult life, Foer is determined to commit one way or the other, motivated by the need to make a decision about how to nourish the body (and the development of an ethical framework) of his newborn son. Babies have a way of catalyzing reflection in their parents. The book provides a candid, fact-based description of how animals are raised and slaughtered, as well as a discussion of the environmental toll of factory farming of cows, hogs, sheep, lambs, chickens and turkeys, and the methods underlying modern corporate cattle ranches. It is a harrowing description of the slaughter of 9 billion animals annually. Few will read it without it finding their perspectives in some way altered. The author presents credible arguments to forego meat that include animal welfare and mitigation of climate change, while also acknowledging (albeit with less evidence) the systemic and humanistic changes that could be catalyzed if we as a society were to end our obsession with meat. For example, Foer notes that Tolstoy famously argued that the existence of slaughterhouses and battlefields is linked. But what sets this book apart from a rapidly proliferating, frequently activist and occasionally strident canon on food, broadly, and vegetarianism, specifically, is the author’s thoughtful and nuanced consideration of the role that meat also plays in our social fabric and family histories. Giving up meat means giving up a way of life, it means declining dinner invitations, saying no to Grandma’s pot-roast, seeking out new restaurants and recipes, and it ruins Thanksgiving. In other words, it demands a new narrative that rejects many of the social acts for which meat is an integral element, and this is isolating. Yet, this isolation is not an uncommon outcome for people throughout history who are on the leading edge of major change. The slow and steady move away from meat is a social change of enormous consequence, as Foer chronicles. Ultimately, the author weighs the evidence and concludes his journey by adopting a vegetarian lifestyle. As readers, humans and vegans, we highly recommend this book, however, I wish the author had made a clear distinction between vegetarianism (no meat) and veganism (no animal products). Adopting a vegetarian lifestyle is an important and laudable step, but by continuing to eat dairy and eggs, one continues to support animal cruelty and environmental degradation, given these products also must be produced at the massive scale that only the animal factory farm model can economically provide.